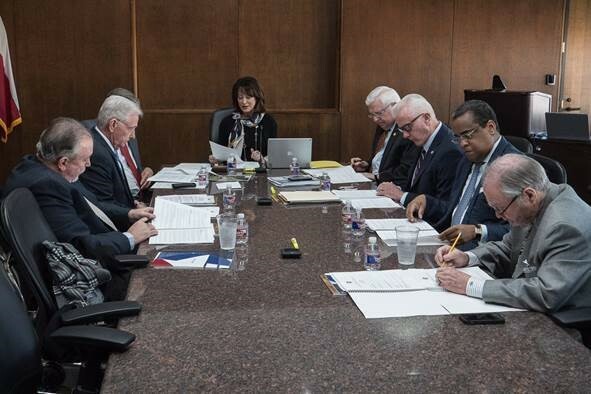 “With the leadership and guidance of our Commission, our port continues to prosper,” Port Houston Executive Director Roger Guenther said in delivering his 2018 year-end report to the Port Commission Jan. 29. Highlighting a host of achievements for 2018, Guenther announced that several records were broken, including total tonnage at Port Houston facilities, which hit 35.7 million tons. That reflected an increase of 9 percent from 2017. “The strength of cargo activity helped drive operating revenue to $366 million for the year, shattering the previous record set in 2017 of $333 million,” Guenther said. Combined business through the port’s public facilities generated a total cash flow of $162 million, surpassing the previous record set in 2017 of $151 million. “Cash generated from operations is critical to funding capital projects that support the port’s strategic objectives, including job creation and regional prosperity,” Guenther said. Container twenty-foot equivalent units increased 10 percent to 2.7 million, a new record for the port. “The increased volume was driven by solid growth in both import and export loaded boxes,” said Guenther. “This activity has created a balance of imports to exports for the year of 50/50 import to export, which keeps us well-positioned for growth in the coming years.” Steel tonnage recorded 4.4 million tons, a growth of 21 percent from 2017.